We were treated to a surprisingly mild day today – around 20°C (68°F), which is beautiful for this time of year. It would have been nicer if it were sunny rather than overcast, but in late October in Ontario you really can’t be picky. I took Raven for a walk (despite that we stayed on our 30 acres, I wore my orange vest just to be on the safe side as I’d heard gunshots from the neighbour’s property earlier in the afternoon) and then bedded down the strawberries before returning indoors. I never got around to harvesting the last of the broccoli this season. It was my first year growing broccoli, and I kept waiting for it to get a bit bigger, but before it got bigger it would undergo a growth spurt and start flowering. I got a few heads, but the last couple I missed. When they started flowering I decided just to leave them; maybe I could get some seeds off them when they were done. I noticed, while I was in the garden tending the strawberries, that the plants are still flowering merrily away. Aside from the odd clover here and the stray aster there, they’re pretty much the only thing in the landscape that still is. This fact hasn’t gone unnoticed. The warm weather this afternoon had some late-season pollinators out looking for flowers to forage on, and they’d all converged on this small patch of yellow blossoms. I’d left my camera up at the house while I took the straw down to the garden, and couldn’t resist going back for it to document some of what was crawling over the plants. There were three bumblebees (three!) 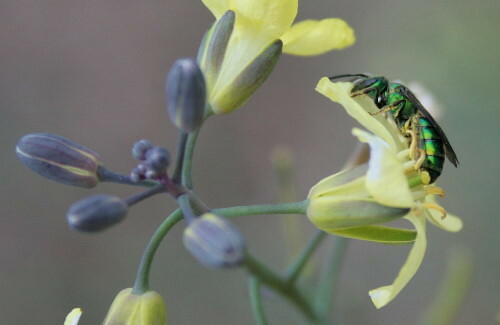 visiting the broccoli flowers. At first I thought this one was Tricolored Bumble Bee (Bombus ternarius), by default due to the orange, though there are actually a few species that sport the orange bands on the abdomen. The most common in the east is Tricolored, but we also have B. sylvicola (no common name) and Red-belted Bumble Bee (B. rufocinctus). 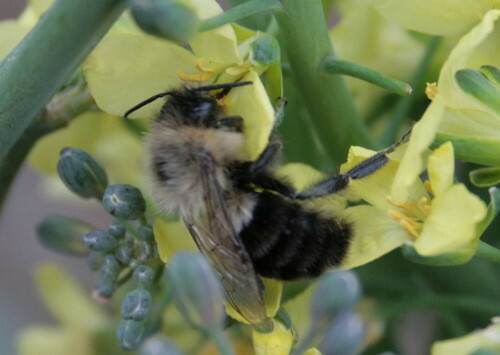 I spent a while puzzling over the photos on BugGuide.net, trying to decide what the differences were between the species, before getting frustrated and Googling a North American bumblebee identification page. 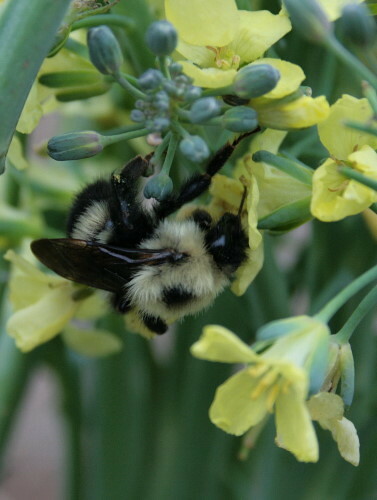 I discovered this great ID page, which is found at Bumblebee.org. It seems to have originally begun as a UK site – if you Google “bumblebee guide”, most of the first couple of pages are UK sites, and I get the impression they’re much more into their bumblebees there than we are here. In any case, that fabulous ID key (now bookmarked!) 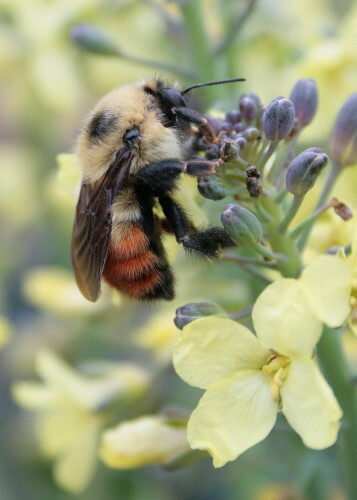 pointed me to Red-belted Bumble Bee, primarily due to the orange butting up against the black on the abdomen – the other species all have a yellow band between them. Bumblebee species #2 is, I’m fairly certain, a Common Eastern Bumble Bee (Bombus impatiens). This species appears to fly quite late into the fall, with BugGuide having records as late as November for Ontario. It’s also very common, and not at all picky in its habitat or food plant selection. Anywhere and everywhere will do for these guys. I don’t know about this one. It looks different from #2 – the blacks look blacker, the spot on the thorax larger, a wider band of yellow on the abdomen – but it could simply be individual variation. Or, it could be a male Red-belted, which show no red belt (just black). I think I’m leaning toward Common Eastern, however… it seems like it has a black head, whereas Red-belted would be yellow, I think. This one looks like a bee, but is actually a fly (note the big eyes that touch each other). There are a number of species of flies that are bee or wasp mimics, their disguise providing them with protection against possible predators. Some are incredibly convincing. 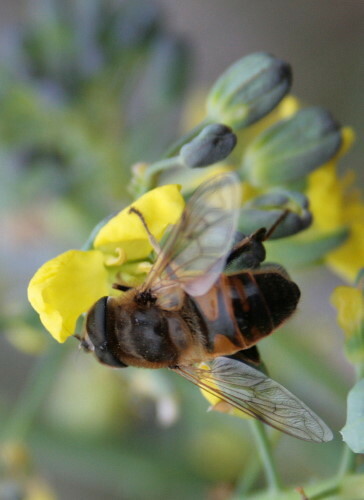 This one looks to be a member of the genus Eristalis, a group whose larvae are aquatic scavengers. I was watching another fly when I noticed one of these guys camouflaged against the stem. A green caterpillar, so well hidden it had taken me several minutes before I noticed one. Looking more closely, I ended up spotting half a dozen. 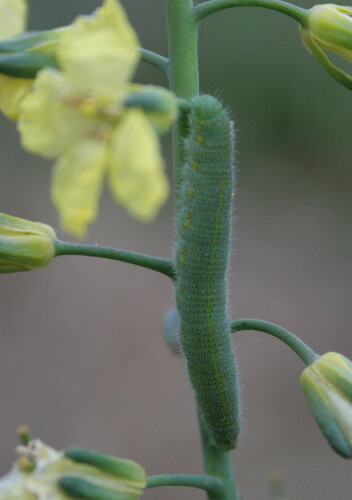 There are three species of green caterpillar that might be found on brassicas such as broccoli, but this one, with the thin yellow stripe, will become a Cabbage White butterfly, a very common species. As I investigated, I spotted one caterpillar who was receiving some special attention from a little fly. It took a bit of hunting, but I believe the double-bulbed abdomen makes this a black scavenger fly, a member of the family Sepsidae, and probably within the genus Sepsis. Google “sepsis fly” and you get quite a number of results of studies looking at copulatory behaviour in the genus… From what I can tell, however, the family are more interested in dead than live material for laying their eggs on/in, and so this guy may not have had any real interest in the caterpillar after all. Then there was this little wee guy. 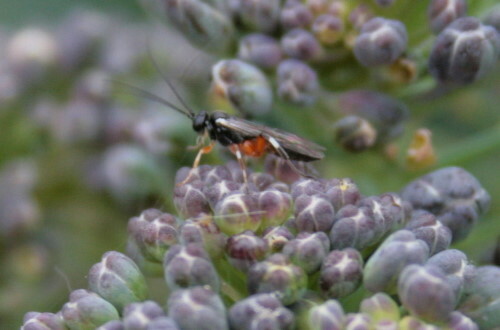 This one really is a species of ichneumonid wasp, and really is parasite of other insects. There are quite a number of species of ichneumonids, and I’m not precisely sure which this might be. I suspect, however, Hover Fly Parasite (Diplazon laetatorius), based on the black body and red legs with white stripes. It’s a widespread species that parasitizes the larvae of a wide variety of fly species. These hemipterans weren’t new for me, though I had to look up their names again. 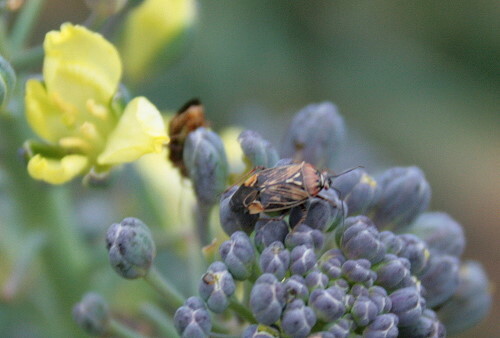 Tarnished Plant Bugs (Lygus lineolaris), or perhaps a related species. It’s a fairly widespread species in the east, and adults are active most of the year, into quite late in the fall. Their larvae are generalists, but particularly like agricultural and commercial crops such as soybean and cotton (and, apparently, broccoli). 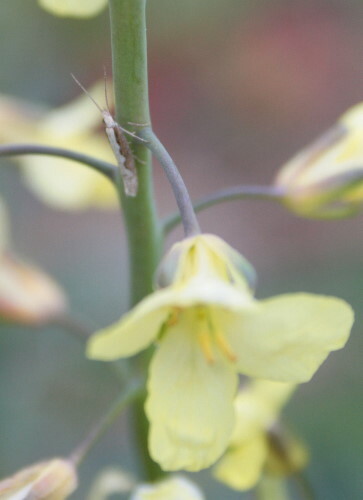 And the final critter crawling about the flowers was this tiny moth. It’s a Diamond-back Moth (Plutella xylostella), an introduced species that was probably accidentally imported in the mid-1800s. 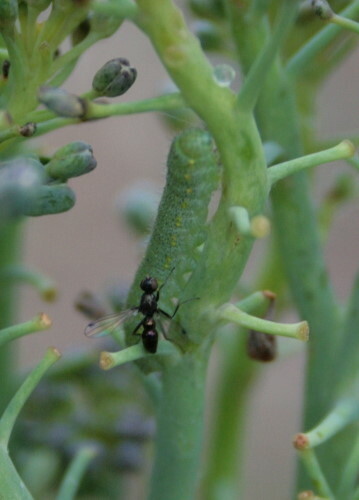 Caterpillars feed on plants in the family Cruciferae which – you guessed it – includes broccoli. Unsurprisingly, adults occur wherever these crop plants are grown (pretty much everywhere), and have a very long flight season. Now I want to go check our Brussels Sprouts (which, so far, have more brussel than sprout) for those elegant caterpillars. Sort of like the last watering hole as the dry season approaches- yet another reason not to be too quick in the fall to clear out the garden! I love my bumblebees. I’ll have to check out the link. 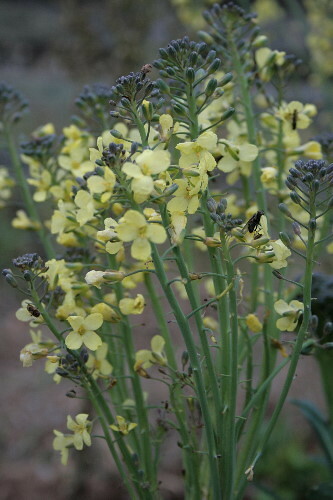 Definitely worth letting a few broccoli heads to flower! That’s a wonderful collection of insects. Lavenderbay – my brussels are pretty small, too. My sister informs me that to get larger brussels you’re supposed to clip off the leaf that it’s forming at just as it starts to form, which encourages the plant to put more energy into developing the bud, and also helps open it up to more sunlight. Barbara and Barefootheart, hope you find the link useful! What an assortment, and all in one place. Kind of reminds me of that saying to slow down to smell the roses. Thanks for the bumblebee link. That’s definitely a jaugar, cheetahs have black lines running from their eyes to their nose. And if you look at the spots, you’ll see that they’re actually rosettes with spots inside of them-characteristic of a jaugar, whereas cheetahs have mostly solid spots. Plus, cheetahs are much thinner. Hi! I was looking for that fly that mimics a bee, the Eristalis, thank you for such a great picture. These have been all over my chamomille today. But I didn’t know what they were. Now I do, thank you!